September 5, 2015, by Ryan. This entry is part 4 of 10 in the Anthropologies #21 series. Up next for this issue we have Todd Sanders and Elizabeth F. Hall. Sanders is an Associate Professor of Anthropology at the University of Toronto. He has written extensively on African and Euro-American knowledge practices, and is currently collaborating with Elizabeth Hall on a project called ‘Knowing Climate Change.’ Hall is a physician-scientist and Research Associate at the Centre for Ethnography at the University of Toronto Scarborough. She trained as a specialist in public health medicine and holds a PhD in epidemiology. –R.A. Global climate change is driving anthropologists in opposite directions. Some are enthusiastically adopting “the Anthropocene” – a “gift” from our friends in the natural sciences (Latour 2014) that might enable us to exit, at long last, our Modern world and its Holocene thinking (Hamilton, et al. 2015). The concept potentially dovetails with old and new concerns – networks, rhizomes and relational ontologies; more-than-human socialities; hybrids, nonhumans and the posthuman; multispecies, multinaturalisms and modes of existence – and promises critical purchase over today’s troubled times. For as we enter the Anthropocene, we’ll need new conceptual tools and ways of thinking to understand our new home. The familiar dualisms that have long dogged our discipline and world – Nature and Culture; local and global; Moderns and non-moderns; and so on – are not up to the task. Discard the Modern dualisms. Dwell on the emergent processes of their production. And reimagine worlds as partial and provisional, composed through multiple, heterogeneous entanglements. For many anthropologists, the time is ripe for such an Anthropocene Anthropology. At the same time, climate change is leading other anthropologists right back to the Holocene. For them, this is not the time to abandon dualisms nor to theorise partial, emergent, hybrid worlds. Instead, we must entrench and purify the well-known anthropological categories of nature and culture, tradition and the local, and insist on the merits of holism. These anthropologists share theoretical affinities more with Julian Steward and Robert Netting than with, say, Latour or Tsing. Their scholarship is large and growing, and asks how climate change will impact local, traditional cultures. The story ordinarily goes like this: local, traditional cultures crucially depend on nature for their cultural, material and spiritual needs. They will therefore suffer first, worst and most directly from rapid climate change. These place-based peoples are somewhat resilient and adaptive, due to their local, indigenous or traditional ecological knowledge. Yet cultural adaptation has limits. Urgent anthropological interventions are thus required to mediate and translate between local and global worlds to help these cultures adapt. The Anthropocene figures here too: not as an opportunity to reconfigure and overcome Modern dualisms but as a way to underscore and holistically integrate them. Welcome to the Holocene! While this approach is strongly endorsed by the AAA’s Global Climate Change Task Force (Fiske, et al. 2014), other anthropologists will insist that in today’s world, old ideas about local, traditional cultures are “obsolete from the outset” (Hastrup 2009: 23). For them, entrenching ourselves in the Holocene is not the obvious way to enter the Anthropocene. Still, it’s worth noting that obsolescence is a matter of perspective and is context-dependent. This pedestrian point is crucial because, when it comes to climate change, anthropology is not the only discipline in town. And because it isn’t, anthropologists may not get the last word on which of our knowledges and knowledge practices are useful, or useless, in the wider climate change arena. In this vast, bustling arena, considerable efforts are being devoted to putting a human face on climate change. For many in the human sciences, this means supplementing and nuancing abstract, paternalistic, quantitative climate sciences with humanistic, qualitative data and values from real people (Hulme 2011; Jasanoff 2010). As we discuss elsewhere, this is one reason growing numbers of social and natural scientists are doing ethnographic research on “the human dimensions of climate change” (Hall and Sanders 2015). From geographers to geophysicists, ecologists to ethnobotanists, scholars from every alcove of the academy are joining the human dimensions enterprise. They travel to remote places on the planet to understand how local, traditional cultures will – or will not – adapt to climate change. And they tell familiar tales: the same tales, in fact, that some anthropologists tell about local, traditional, place-based cultures being done in by a changing climate. In this broader academic arena, such local, traditional peoples are fast becoming the human face of climate change. Figure 1, reproduced from a leading interdisciplinary climate change journal, is emblematic. Figure 1. 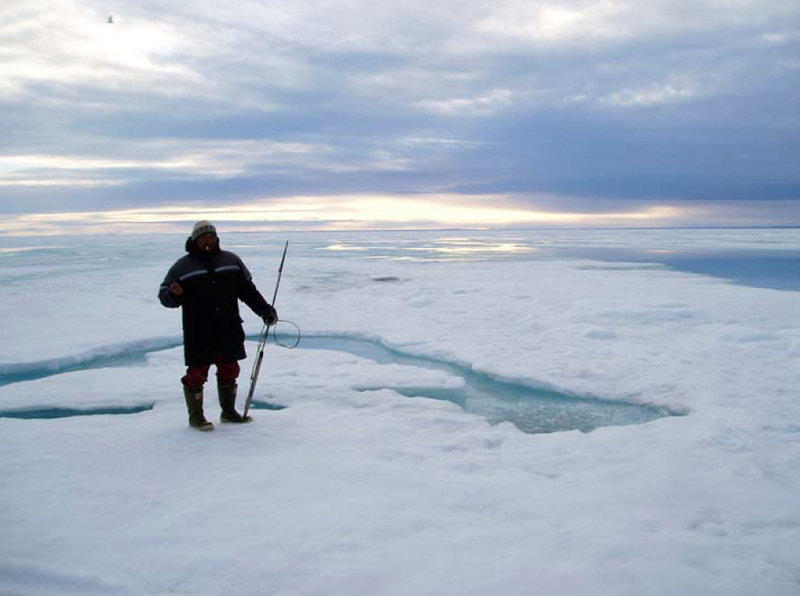 “Theo Ikummaq in the middle of Fury and Hecla Strait, between Igloolik and Baffin Island, explaining the challenges with spring ice conditions, while waiting at a seal hole (June 22, 2005).” (With kind permission from Springer Science+Business Media: Climatic Change, Travelling and hunting in a changing Arctic: assessing Inuit vulnerability to a sea ice change in Igloolik, Nunavut, 94, 2009, p. 375, Laidler GJ, Ford JD, Gough WA, Ikummaq T, Gagnon AS, Kowal S, Qrunnut K, Irngaut C, figure 2). This scholarship shares affinities with salvage anthropology and cultural ecology, and while not unaware of the many critiques of such projects, remains mostly unfazed by them. These are urgent, real-world problems, after all, that require serious ethnographic attention. There’s no time for wiffle-waffle. But whatever one’s views on the matter, the point is that this multi- and interdisciplinary scholarship is large, and working hard to complement and complete the climate change puzzle: to serve up culture to nature, local to the global, traditional to the modern, values to facts, indigenous knowledge to Western Science. This is Holocene thinking replayed with a vengeance. After decades of imploring social scientists to step up to the plate, to leave our ivory towers, to add the missing human piece to the climate change puzzle, “harder” natural scientists are welcoming such “soft” climate change scholars and scholarship. Of course economists got there first. But this new wave of human dimensions scholarship provides hope that, after decades of delay, important aspects of “the human” might finally be fleshed out and “integrated” into our understandings of climate change. These hopes are understandable, given the Modern metaphysics many in this arena share. It all began with capital-n Nature, which natural and computational scientists reanimated decades ago. Today, this Nature takes the form of coupled Ocean-Atmosphere General Circulation Models (OAGCMs) and Earth System Models (ESMs), which rely on formally-specified (i.e., mathematical) equations to model the Earth System’s natural components and the complex links among them. “The human” came later. Social scientists from many disciplines are now adding in the human, or trying to, and the calls for more such efforts continue. But however funded, efforts to “integrate” human and natural components of the system in the name of climate change are legion. Consider the tightly-coupled Integrated Assessment Models (IAMs), which aim quantitatively to bring diverse natural “scientific, economics and social science expertise together to provide analysis and advice that comprehensively addresses all or at least many aspects of the climate change issue” (Sarofim and Reilly 2011: 27). There are also many looser modelling efforts with telling titles – coupled human and natural systems (CHANS), human-environment systems (HES), social-ecological systems (SES) – that aim to couple human and natural components of the Earth System. Such holistic, Modern integrationist efforts stabilise “components” through the act of “coupling” them, and sometimes mistake models for the world. They are also widespread and flourishing. We want to build a unique transdisciplinary research environment where innovative ideas can flourish. By combining new forms of cooperation with a holistic perspective, we hope to generate the insights that are needed to strengthen societies’ and the ecosystems’ capacities to meet a world which spins faster and faster. Folke is one of the Centre’s founders, and has devoted much of his distinguished career to theorising “resilience” and “social-ecological systems.” While Figure 2 is illustrative of some of his influential work on coupled systems, similar diagrams could be reproduced from countless other scholars. Figure 2. A conceptual framework developed in relation to the resilience approach. (Republished with permission of Global Environmental Change, from “Resilience: the emergence of a perspective for social-ecological systems analysis,” Folke, C., vol. 16, 2006; permission conveyed through Copyright Clearance Center, Inc.). Note how the all-embracing social-ecological system is composed of Latour’s modern constitution: a Great Divide between Nature (left) and Culture/Society (right), with feedback loops between the system’s component parts. Note, too, how scale works, also in a Modern register: each side is composed of “nested hierarchies,” the “larger” levels encompassing the “smaller.” (There’s obvious scope here to fill local slots with local knowledges and peoples). While Folke acknowledges that these are conceptual models, many others do not, leading to statements like “[c]oupled human and natural systems (CHANS) are systems in which humans and natural components interact” (Liu, et al. 2007: 639). Coupled systems scholarship may enable us to sort messy empirical worlds into tidy, Modern boxes, and to pretend we haven’t done so. But such purifying practices are of little interest to Anthropocene Anthropology, and do not create an environment in which Anthropocene thinking might flourish. Where to find such a place? Last year, we attended Carbon 14: Climate is Culture, an innovative ArtScience collaboration at the Royal Ontario Museum in Toronto. The event was produced by a London-based charitable organisation whose mission is to bring together artists, scientists, journalists, media specialists and other publics “to stimulate a cultural narrative that will engage and inspire a sustainable and vibrant future society” in the face of global climate change. The four-month-long exhibition and festival was big, Canadian-flavoured, and guided by a single question, and answer, prominently printed on the catalogue cover: “What does Culture have to do with Climate Change? Everything.” The “culture” had two senses: as in the cultural arts (music, theatre, photography, etc. ), which play a crucial role innovating and communicating to the public; and in the anthropological sense (more or less). The event featured a performance by Inuit musician Tanya Tagaq and a mock trial of Canadian broadcaster, environmentalist and scientist, David Suzuki, for his Carbon Manifesto; poetry slams and a performance art piece by Dene-Inuvialuit artist, Reneltta Arluk, that examined “the impacts of climate change on Northern peoples and explore[d] the artist’s personal cultural identity;” talks by journalists, artists and others on fossil fuel dependence and the health of the oceans, biodiversity, sustainability and extinction; workshops on provocative, environmental activist arts; public discussions, including one with University of Victoria climate scientist Andrew Weaver and Sheila Watt-Cloutier, the well-known Canadian Inuit cultural and human rights activist and author (Watt-Cloutier 2015). The event also featured visual arts and artists: videos produced with Inuit filmmakers on climate change and Inuit traditional knowledge, on everyday life in the far North, and others; photographs of majestic Nature; and awe-inspiring photos that the Canadian astronaut, Chris Hadfield, took from outer space. Arctic climate change is a hot topic with surface air temperatures in the region warming at double the global average, and corresponding loss of sea ice, glaciers, and permafrost being observed by both scientists and local people. In Canada’s North, Inuit are on the front lines, and traditional knowledge and experience indicate that climate change already affects travel routes and safety; wildlife, vegetation and habitat; human food security and health; and communities and coastal infrastructure. These cumulative impacts challenge cultural and social identity. However, with an ancient culture, persisting over millennia, Inuit show that human ingenuity, connectedness with the land, and respect for future generations are all-important teachings for the modern world as we collectively face climate change, the paramount issue of our time. So, what should we think when so many cutting-edge scientists including anthropologists, avant-garde artists, activists, journalists, charitable foundations, non-profit and government funders from across the planet are living happily in the Holocene – as if our theoretical lexicons and social imagination were firmly fixed, if not 1000 years ago today, perhaps 100? Who in this world is ready for an Anthropocene Anthropology? Are there grounds for hope? Enthusiasm? We think so, but only with certain shifts in anthropological practice. First of all, more critical reflections, debates and theorising of anthropological knowledge practices around climate change are required. Many anthropological writings on climate change imply that holistically integrating our discipline’s disparate questions and theoretical concerns, knowledges and knowledge practices is possible and desirable – a win-win scenario, as it were. This approach is seductive: it suggests that every anthropologist can contribute her or his crucial piece of the climate change puzzle. But it is also seriously undertheorised, and does not accord with current thinking in the social sciences – including in anthropology – about what knowledge is and how it works. Partial connections and incommensurabilities render puzzle metaphors suspect. Knowledges are not puzzle pieces, nor can they simply “add up” to create “the whole.” Focus is required. Choices are always made. Power is never absent. Such commonplaces hold within as well as beyond anthropology. For these reasons, sustained engagements with social theory and the anthropology of knowledge would prove productive. How should we understand climate change anthropologically? Which of our many competing analytics provide the most theoretical purchase over the problem at hand? What are their real-world consequences? Should we dwell on culture or “culture”? Local or “local”? Or something altogether different, of which many promising candidates exist? Forging a meaningful Anthropocene Anthropology will mean prioritising certain anthropological knowledges, analytics and concerns over others. We can’t have it all ways. Second, whatever our disciplinary response, we must recognise that anthropologists may not be the final arbiters on which of our knowledges and knowledge practices find favour in the wider world. Anthropology, after all, exists in a broader context. And as every anthropologist knows, context matters. The way forward is thus not to repeat, at higher volume, the truism that anthropology has lots to offer. It is to anthropologise the myriad Euro-American contexts in which climate change knowledge is produced and put to work. This means critically interrogating natural and social science knowledge practices surrounding climate change (e.g., interdisciplinarity, collaboration, producing “useful knowledge,” etc. ), as well as the disparate policy and science policy realms through which scientific knowledges of climate change are institutionalised. Venerable traditions in political and legal anthropology, and in the anthropology of science and of policy, point the way. But whatever context we choose to study – there are many – Anthropocene Anthropology has its work cut out for it. For in today’s world, as Geertz might have said, it’s Holocene turtles all the way down. Fiske, Shirley, J., Crate, Susan A., Crumley, Carole L., Galvin, Kathleen A., Lazrus, Heather, Luber, George, Lucero, Lisa, Oliver-Smith, Anthony, Orlove, Ben, Strauss, Sarah and Wilk, Richard R. 2014. Changing the atmosphere: anthropology and climate change. Final Report of the AAA Global Climate Change Task Force. Arlington, VA: American Anthropological Association. Hall, Elizabeth F. and Sanders, Todd. 2015. Accountability and the academy: producing knowledge about the human dimensions of climate change. [link: http://onlinelibrary.wiley.com/doi/10.1111/1467-9655.12162/epdf] Journal of the Royal Anthropological Institute 21(2): 438-461. Hamilton, Clive, Bonneuil, Christophe and Gemenne, François, eds. 2015. The Anthropocene and the global environmental crisis: rethinking modernity in a new epoch. London: Routledge. Hastrup, Kirsten. 2009. Waterworlds: framing the question of social resilience. Pp. 11-30 in The question of resilience: social responses to climate change, ed. K. Hastrup. Copenhagen: Special-Trykkeriet Viborg a-s.
Hulme, Mike. 2011. Meet the humanities. Nature Climate Change 1: 177-79. Jasanoff, Sheila. 2010. A new climate for society. Theory, Culture & Society 27(2-3): 233-53. Latour, Bruno. 2014. Anthropology at the time of the Anthropocene: a personal view of what is to be studied. 113th Annual Meeting of the American Anthropological Association Annual Meeting. Washington DC. Liu, Jianguo, Dietz, Thomas, Carpenter, Stephen R., Folke, Carl, Alberti, Marina, Redman, Charles L., Schneider, Stephen H., Ostrom, Elinor, Pell, Alice N., Lubchenco, Jane, Taylor, William W., Ouyang, Zhiyun, Deadman, Peter, Kratz, Timothy and Provencher, William. 2007. Coupled human and natural systems. Ambio 36(8): 639-49. Sarofim, Marcus C. and Reilly, John M. 2011. Applications of integrated assessment modeling to climate change. WIREs Climate Change 2: 27-44. Watt-Cloutier, Sheila. 2015. The right to be cold: one woman’s story of protecting her culture, and the Arctic and the whole planet. Toronto: Allen Lane.